I’ve Chosen My Web Designer but What About Website Content? A substantial amount of good quality text within your website is crucial to gaining a high ranking within the Google Search. In this day and age it isn't Golden Pages that people are looking to for business listings but instead are performing searches on google for companies and services. Potential customers are searching for services you offer. Google now processes over 40,000 search queries every second on average which translates to over 3.5 billion searches per day and 1.2 trillion searches per year worldwide. This means you'll definitely want to be found on the web by potential customers. Interesting, well informed content, will help you achieve this. 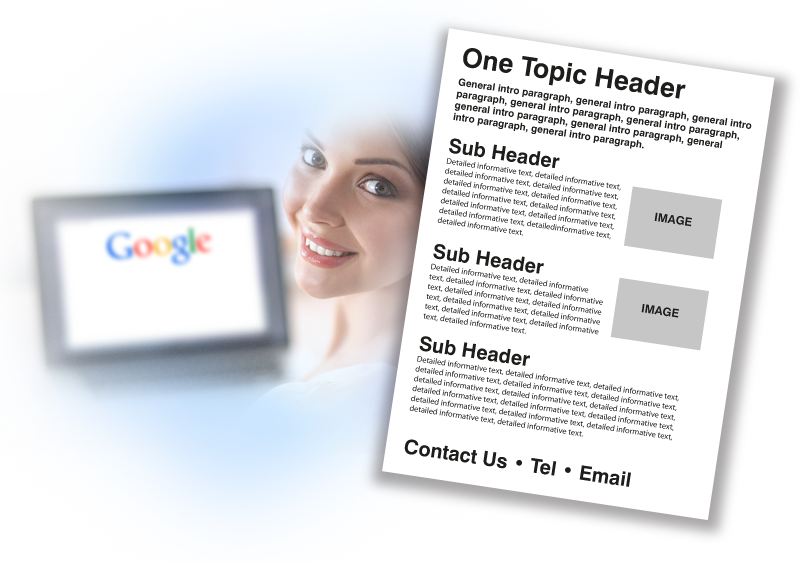 Quality detailed text that provides solutions to the searchers question will elevate your website into a top ranking and YOU are best placed to be writing text for YOUR website. You know your company, you know your business and you know what your customers are interested in. Or you should do. You also want to be aiming to outperform you competition's website by providing more detailed and informative information than they do while keeping this information up to date and relevant. Your website is a great opportunity to trump your competition and attract new customers. Try and make the time to put the text together, it will pay off. The whole point of being in business is to attract customers, gain customers and make money. The website you have asked me to design and build will do this if the content is of a detailed and engaging nature. In other words the more useful and informative content that you provide and appears on your website the higher your website will appear in the Google Search. The higher up in Google your website appears the more viewers will click through to your site. The more traffic to your site the more chance of converting this traffic to paying customers. The website content is fundamental to gaining a high ranking in Google and attracting more attention. Of course I can advise and help you with the writing but be aware that the more detailed and informative copy you can write the better your chances of appearing higher in the Google search. I see time and time again on websites general text that could be far more detailed and informative. This situation seems most prevalent on the average 'services' page where there is scant information giving a very brief synopsis of the 'services' a company offers. A list of bullet points with a couple of lines of text is nowhere near enough. By far the best approach is to dedicate a page per service or sector instead of a general listing of services. Each service a business offers should have it's own page with detailed engaging and informative copy. Each page should also contain a couple of images to backup the information as well as a unique page title encapsulating what the service is or what the page is about. Google loves to see ONE TOPIC for ONE PAGE rather than an inadequate synopsis of general information. Your website is a great opportunity to tell the world in detail about what you do. Don't waste it! Treat your website like a giant advertisement for what you do. The more informative text included the more interest you will receive. And why not have contact details at the bottom of these pages? Make it effortless for a potential customer to get in contact. If they like what they read and you are providing a detailed solution to their problem they will pick up the phone or fire out an email. Aim for around 400-500 words per topic/page. More if you need to say more. Where Do I Begin, What Do I Write for My Website? First and foremost write about what you know. Prove to Google you are an authority on your subject and business. Don't get me wrong. This can be a bit daunting at first but always keep in mind 'the more informative text and content I provide the more viewers (and customers) my website will receive'. Initially I always advise my clients to have a look at the competition's websites to get an idea what to write. What can you say on your website that they are not doing. Looking at the competitior's websites will give a starting point, however this is purely for inspiration, under no circumstances lift 'chunks' of text from your competitior's websites. Looking at what others have written will give you ideas as to what to write as well as identifying your own 'Unique Selling Points'. In other words what am I doing that they are not. What services am I providing that they are not. If you are doing something others are not potential customers will be interested. You'll find after a time writing will become natural and the website will afford you an opportunity to keep people informed and updated with information. A blog or news section is an ideal way to keep a website updated with current news and inormation. Google loves websites that are updated on a continual basis. Imagining different scenarios may also help. For example if you are a builder and one of your services is fixing roofs; what would you say when asked what type of roofing repairs you undertake. What would you say? Maybe something along the lines of describing past jobs, including flat roofs, slate roofs, best materials to use for certain jobs. How best to treat a flat roof. If you gain the interest of the person asking the questions the talk will become informative and conversational. Translate this into content for your website. I wouldn't be afraid of adding in some technical jargon where needed but I wouldn't overdo it as you don't want to confuse. However getting into the technicalities, where needed, will demonstrate you know your business and what you're talking about. In time you'll even see how writing about what you do and about your business and industry will help clarify your business and objectives in your own mind and even give you ideas for future paths for your company. If you write naturally, keywords will appear naturally within your text. Keywords and phrases are definitely worth thinking about as it is these 'words' that your website will be indexed under within Google and ultimately be found by a potential customer or client. However be aware that Google is highly intelligent and is constantly evolving. Google is now far better at understanding a user's search 'intent'. This means it's better to have 1 main keyword target for each page, and then to target associated variations of that keyword on the same page. In fact an ideal situation would then be to link some of these keywords to their own pages. For example I could have a page dedicated purely to 'WordPress Website Design' or a page about each of my 'Website Design Services'. I would also advise keeping website text conversational (especially within the Blog) and informal (although not too informal, ultimately depending on the nature of your business). Gauge what will work for your customers. Overall remembering to write for the user or customer, NOT for Google or any other search engine. Don't try to be clever and stuff copy with keywords. This will not work and in fact may drop you in the rankings. Write for the user, write copy that will appeal and inform your viewer. Avoid repeating the same keywords throughout the page text but instead use associated keywords that make the page relevant for as many searches around a concept as possible. More information on keywords can be found here. Remember if you want a higher ranking in Google write as much detailed and informative text as you can and keep your website updated with current information.